Automated vehicles (AVs) promise to bring us a new era in transportation, with the potential to be safer and more efficient than the vehicles we drive today. But enabling the safe integration of AVs into the transportation system involves a tremendous data challenge. Automated vehicles generate and rely on huge amounts of data, including information about vehicle performance, road conditions, and infrastructure. That data comes from many sources, including government, industry, and academia. However, concerns about business competition, intellectual property, and liability have inhibited the exchange of data that the field now needs. In 2017, the U.S. Department of Transportation (USDOT) recognized this problem and invited CODE to organize, facilitate, and capture lessons learned from a Roundtable on Data for Automated Vehicle Safety. That Roundtable, held in December 2017, brought together thought leaders to discuss how voluntary data exchanges could be set up and used to accelerate the safe rollout of automated vehicles. 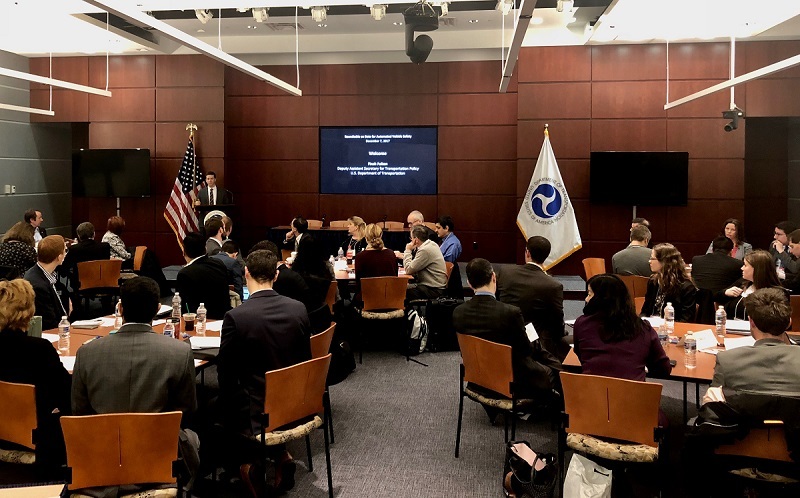 This event brought together over 60 participants from federal, state, and local government, the private sector, non-profit organizations, and research centers to discuss the data exchanges that can be most critical to the safe deployment of automated vehicles. Derek Kan, the USDOT’s Under Secretary for Transportation Policy, described the Roundtable as “a key step toward developing a shared understanding of the data to be collected and exchanged, the purpose, and the federal government’s unique role in facilitating voluntary data exchanges.” The Roundtable and CODE’s report led to a number of pilot projects that have opened new opportunities for applying data to automated vehicle development, including the Work Zone Data Exchange. The USDOT is now expanding its work through the Data for Automated Vehicle Integration program, with CODE playing a continuing role in stakeholder engagement and concept development.